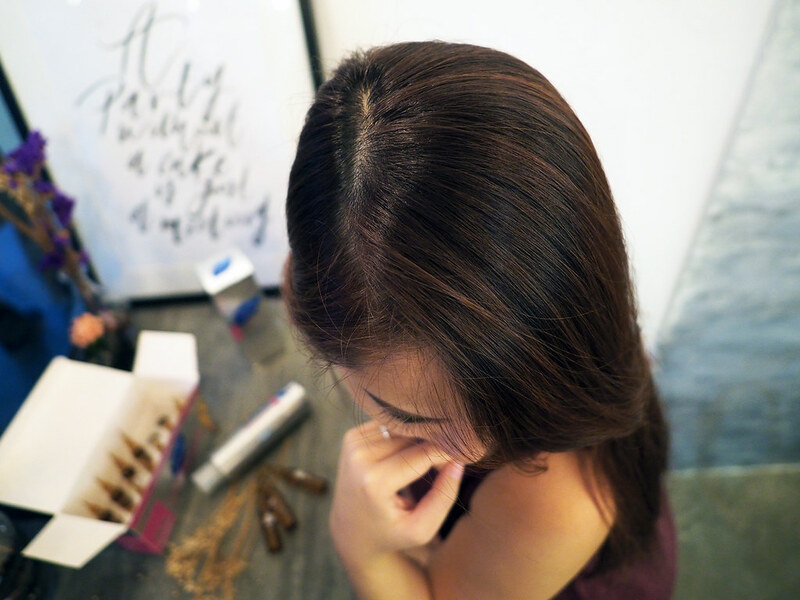 So a few posts ago on my blog, I was talking about life and its problems, and one of them included thinning hair and an alarming amount of hair fall due to overwhelming stress. 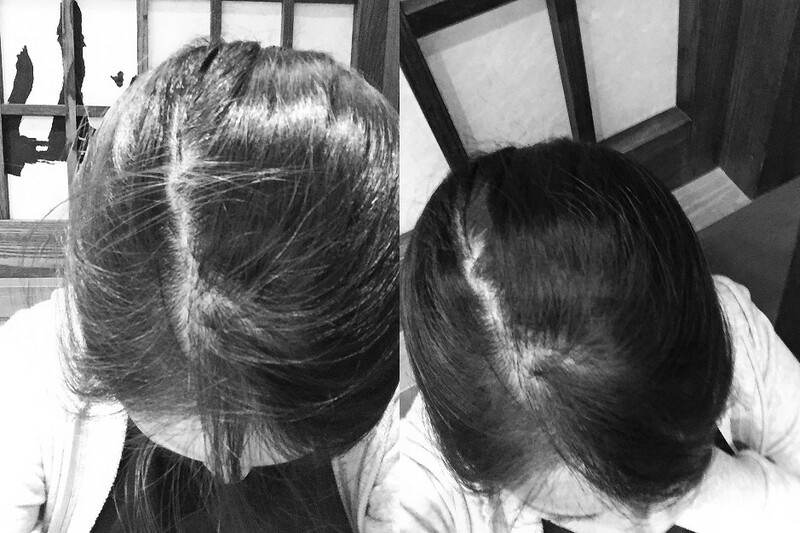 I was freaking out over how much hair I was losing, so I took some frenzied photos on my phone of my scalp and I was dismayed to find out that my worst fears were true – I WAS having a much more obvious gap in my hair line area and generally, my hair looked so wispy, thin and unhealthy! It had the barely-there look instead of full and luscious as it should have been. Please look at how my hand is covering my mouth in the 2nd pic, because I took the first photo, and gasped out loud because I couldn’t believe my eyes… I had to take another photo to reaffirm that what I was seeing is true. And damn. True it was, my thinning scalp staring back at me. I used to have very healthy hair that was soft as silk to the touch and shined from every angle (NOT EVEN KIDDING), so it made me extremely upset to see my hair in this condition. I knew it was due a combination of reasons: poor lifestyle such as sleeping late or not getting enough rest, undesirable diet thus not getting enough nutrients and minerals, and most of all, a level of stress that my body wasn’t used to dealing with. 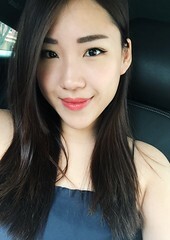 To begin with, since birth, I’ve had thinner hair than people of a very fine texture that would break, snap or fall off easily. My hectic lifestyle wasn’t making things any better for my poor scalp. I’m only 24!!!!!!! I can’t go balding so soon!!!! If my scalp looks like this at 24, I can only imagine what 42 would bring. I’m living proof that you don’t have to be middle aged or elderly to experience thinning hair problems. I’m barely in my mid twenties and already suffering from this condition. For many months, I used to drop so much hair that I would have to sweep my room’s floor every single day, for it would be littered with strands of sad looking hair on the floor. Looking at how much hair I dropped only made me more stressed, which in turn, made me drop more hair. It was a horrible cycle. I heard that washing your hair too often would cause it to fall, which turned out to be a silly myth because all that did was make my scalp clogged, disgusting and oily! Which could, in turn, lead to even more hair loss, by the way. I was really desperate to find something that would aid me in my situation, and so it was very timely that I was introduced to PHYTO in my moment of need! For over 40 years, PHYTO has been working with the scientific world to fine-tune innovative products with scientifically proven results through clinical testing and patent submissions. 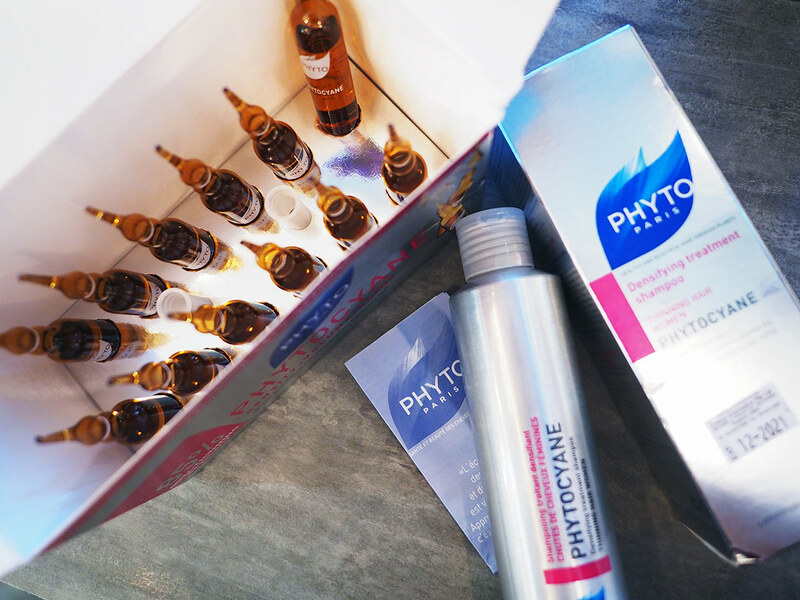 PHYTO hair care products draw from the heart of the botanical world to reach the most high-performance active ingredients to preserve the health and reveal the natural beauty of the hair. 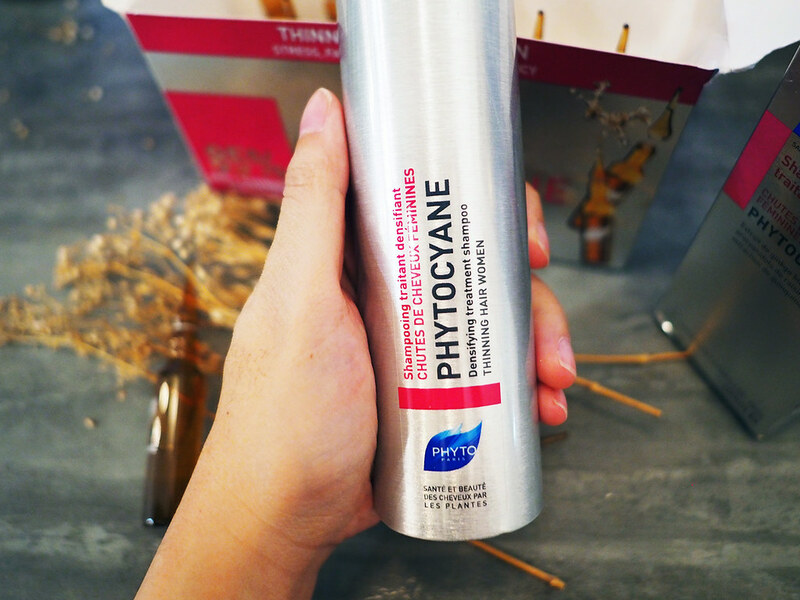 The Phytocyane series includes a Shampoo and Treatment product. Shampoo: Improves the density and shine of fine, thinning hair with this unique combination of revitalizing botanicals and fortifying vitamins. It prepares the scalp to receive the full benefit of ‘Phytocyane Revitalizing Serum’, leaving hair fuller, stronger and more lustrous with each use. 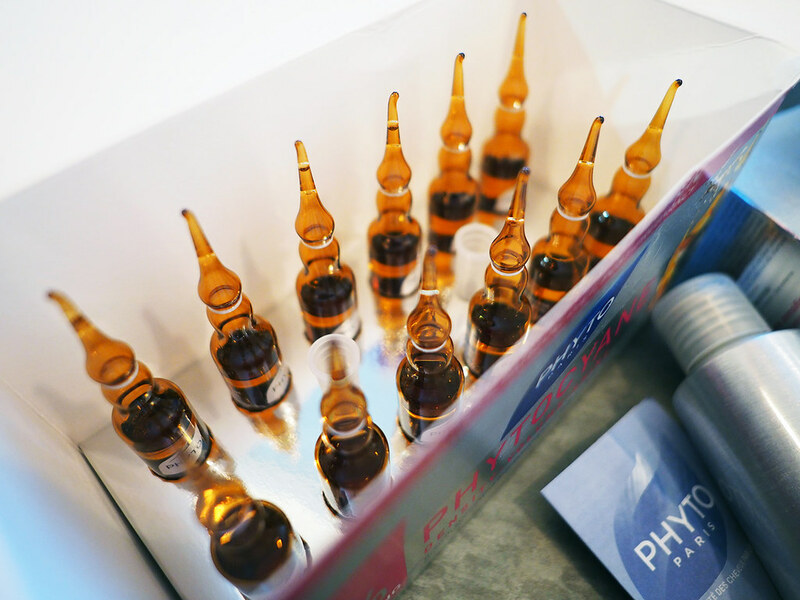 Treatment: The Phytocyane treatment is a triple action serum that supports fuller, thicker hair as it grows while delivering exceptional cosmetic and anti-aging benefits. The advanced formula supports scalp micro-circulation to create an optimal environment for healthy hair growth. It powerfully combines sulphured amino acids, B vitamins, and silk proteins to encourage keratin production at the follicle level and improve thickness of the hair. Use it to create thickness on every strand, maximize fullness and enhance shine. An added bonus: used year-round, this serum helps to keep gray hair at bay! So how do you use the products? For the shampoo, wet your hair in the shower, then massage it into your scalp and work it all the way to your hair ends, then leave it on for 2 minutes before rinsing off thoroughly. The smell of this shampoo isn’t your typical over the top fruity or sweet smelling soap. It has a brownish color, smells rather herbal / botanical in a pleasantly mild way, and the texture is more like a viscous gel than soap. Use daily. 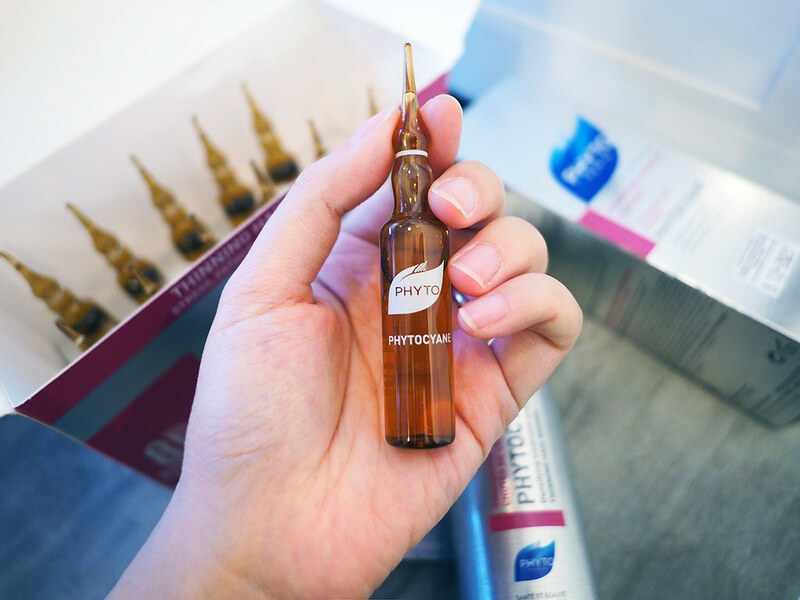 As for the treatment, you’re supposed to carefully break off the top of the glass ampoule with a towel, then use the nozzle they’ve provided to apply it all over your towel-dried hair/scalp in straight lines, then massage in with your fingertips, and do not rinse off. Use 3 times a week for 1 month for intensive treatment, or once a week for 2 months for maintenance. 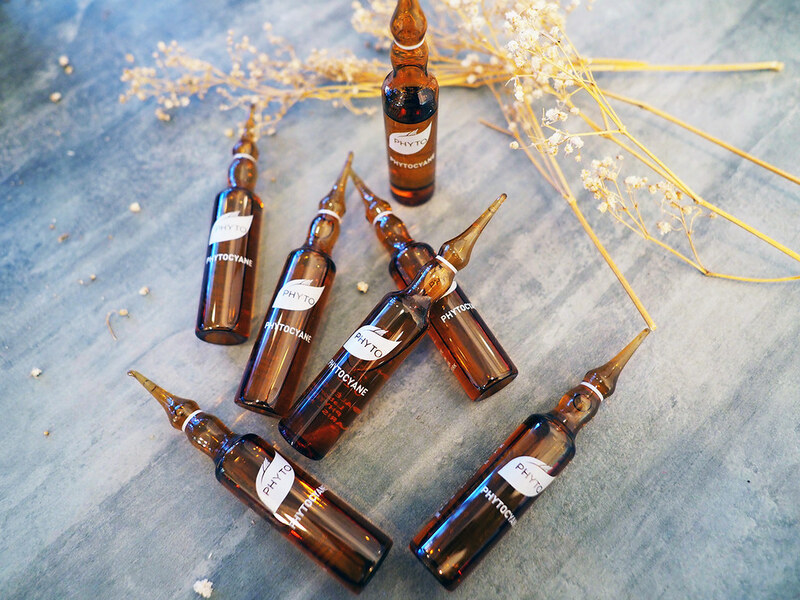 I actually really enjoying using the treatment ampoules very much because I love the tingly, cold feeling I get when the product is applied all over my scalp! It gives me a very refreshed feeling, and it’s also a good reason for myself to ask my boyfriend to give me a nice head massage. Win and win. I’m really happy to report that my hair loss problem seems to have been visibly minimized in recent times, check out the results below for yourself, because seeing is believing!! My scalp now, VS what it was less than a year ago, is truly a world of difference. My hair line is a lot less visible, and my hair generally looks fuller, thicker, stronger and healthier. So so happy that I don’t have to worry about thinning hair problems anymore… I’m too young to go through that right now!!!! Also, check out how long my hair is now! It hasn’t been this long in many years and I was so surprised when this back view photo was taken of me, because it doesn’t look this long from the front when I look into the mirror. You know what they all say. The longer hair is, the more difficult it is to maintain, so I’ve been putting extra effort into trying to take better care of my mane! I have a useful hair tip for you girls, especially those with long hair. Avoid brushing your hair too much or with too much force when it’s wet. I’ve found that my hair gets weak and breaks easily when I brush it straight out of the shower, so what I do nowadays is blow it dry under medium heat (nothing too hot which will dry out your hair even further) and then when I’m convinced it’s totally dry, I give it a few light strokes with my brush, and I leave it at that. Just overjoyed to run my fingers through my head of hair now to feel its new found volume and health!!!!! 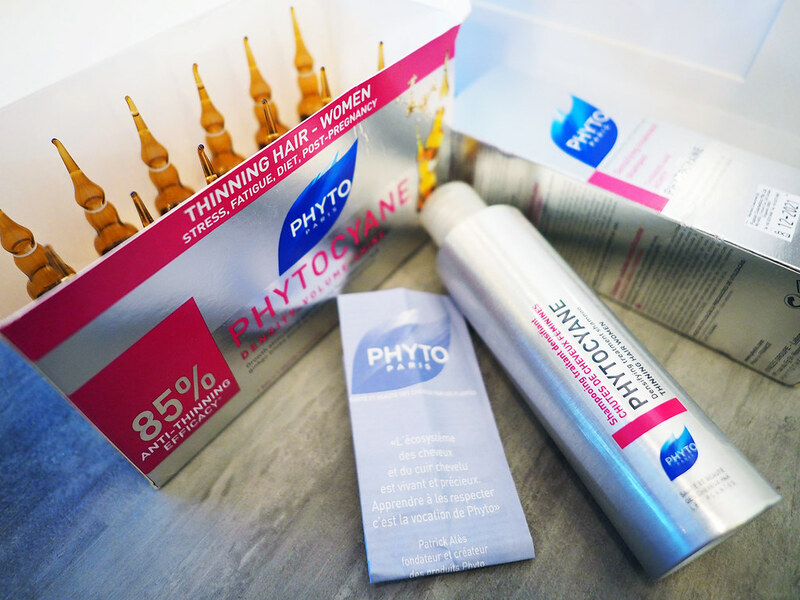 While my hair’s texture is still thin and fine because that’s how it’s always been, the overall quantity seen on my head is a visually significant improvement from before I started treating it with Phytocyane’s anti hair thinning products. These kind of problems are best treated as soon as they are discovered, so if you find that you’ve been dropping a lot more hair than usual, please don’t sit around and wait for the condition to get worse! Find your problem, target it with treatment and fix it – you’ll be thankful to yourself that you did! I can rest easy now knowing that thinning hair isn’t on my list of problems. 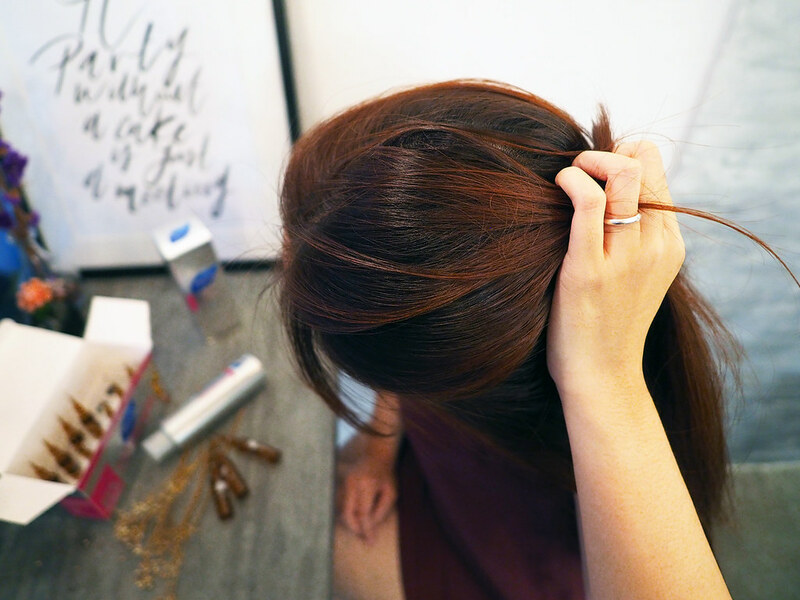 I got 99 problems but thinning hair won’t be one anymore. I’m holding a giveaway where you get to win your very own set of Phytocyane Revitalizing Treatment which I’ve been talking about – head on to my Instagram (@Shiberty) to learn more! This entry was posted in beauty reviews, sponsored posts by shiberty. Bookmark the permalink.